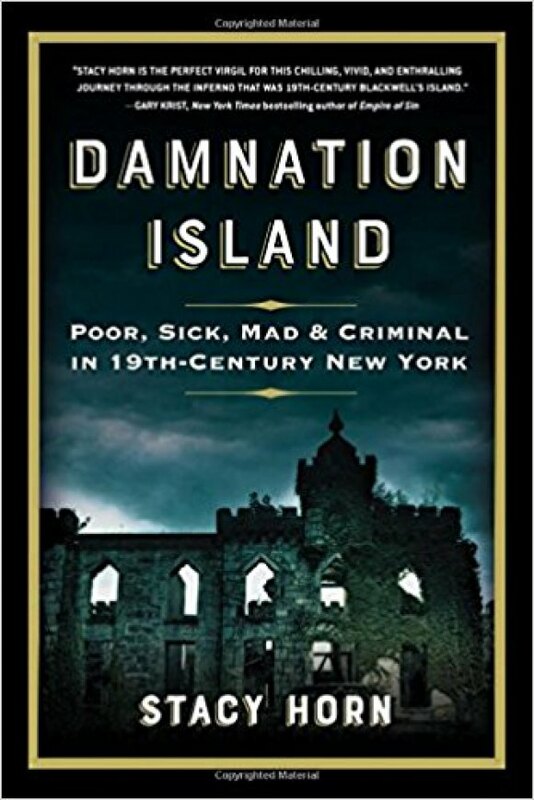 Reader Sylvan Klein turned me on to a New York Times review of DAMNATION ISLAND, Poor, Sick, Mad & Criminal in 19th-Century New York By Stacy Horn. Along with Long, Hog, Welfare and Blackwell's, Roosevelt Island gets another name, this one more description than label. Now, we get to hear from the author, courtesy of our historical society. In the 19th century, New York confined the poor, the insane, the criminal and the sick to Blackwell’s Island. Here, nestled between the teeming shores of Manhattan and the rural farms of Queens, these unfortunates were warehoused in deplorable conditions, squalor and neglect. Author Stacy Horn will describe the notorious history of Damnation Island at a lecture presented by the Roosevelt Island Historical Society at the New York Public Library Branch on Roosevelt Island, on Thursday, December 6, 2018 at 6:30 p.m. The event is FREE and open to the public. It is the second in the Society’s annual series of fall lectures, which is supported by funds provided by Roosevelt Island Operating Corporation’s Public Purpose Fund and New York City Council Member Ben Kallos, with funding from the New York City Department of Youth and Community Development. Horn's book looks at a not unfamiliar story of Roosevelt island history and makes the connection with a legacy she sees in the prison at Rikers Island. The facility along with its inmates migrated after Blackwell's was reinvented as a more benign Welfare Island. For more than a century, what is now Roosevelt Island had been home to not just the prison, but also the almshouse, the lunatic asylum and the Smallpox Hospital. It was where you were likely to end up if were deemed undesirable by conduct, illness or poverty and, therefore, unfit for brushing elbows with Manhattanites. As the city grew rapidly, so did crowding on Blackwell's Island along with other horrors. What's surprising now and a demonstration of the distance we've covered in 200 years is that there's no such thing as a "lunatic asylum" anymore. What once disgusted Charles Dickers had enough of its structure remaining for it to form the central lobby of The Octagon apartment complex. WNYC's Radio Rookies did a report on it in 2010. Few people realize that Thomas Edison, along with his work with electricity, was also a pioneering videographer nearly a hundred years before the term got invented. From the National Archives, here's video he shot from a boat passing Roosevelt Island on the Queens side in 1903. You can see the lighthouse, the (Octagon) Lunatic Asylum and at the tip, where FDR Four Freedoms Park now harmonizes the southmost tip, the notorious prison that later moved to Rikers.